When I started making wine I read a lot about it. And I found recipes which I thought were really weird. People make wine from almost everything. I once even saw a recipe that contains chocolate! Since I was just trying to make a normal good wine I did not pay much attention to these crazy ideas. However, one of them stuck and I wanted to try it for a long time: Parsley wine. Especially when I found out that parsley is apparently very healthy. So I looked for a recipe and I found that there are 2 kinds. 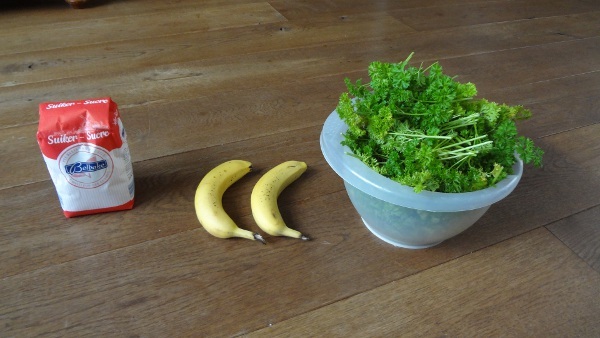 The first is very simple: Buy a bottle of white wine and add some parsley. If you want your wine to be healthier and tastier I think that this is a good option. 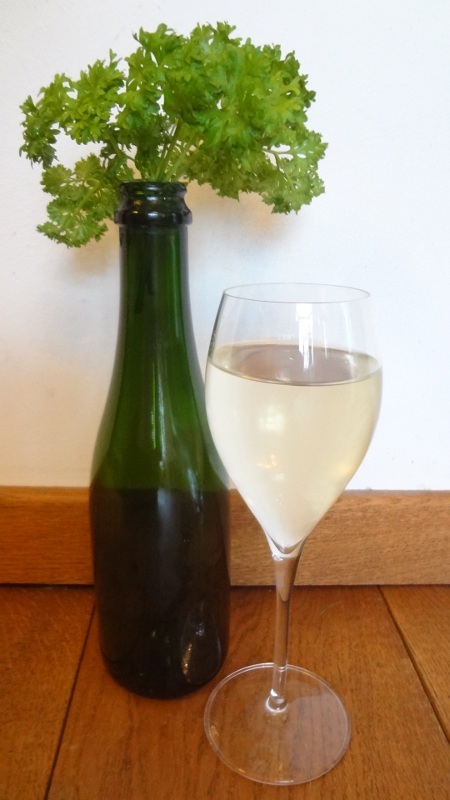 If you are a wine maker you would choose for the second option: Create your own parsley wine! After 3 days, rack into another bucket or demijohn. The recipe was completely new to me but I had some ideas about it. It should be a light, fresh wine that perhaps could be drunk rather quick. It is rather safe to assume that there is not too much sugar in parsly. (Let’s say none.) 1 kg sugar in 5L gives you approximately 11 % alcohol. In the bananas is some sugar but that probably would not even produce 1% alcohol. Since some alcohol would evaporate in the demijohn I did not include the bananas in the calculation. I assumed that there also would not be much acid (close to none) in parsly so I added 6 gm/L citric acid. Citric acid is stronger than tartaric acid so the acidity would be around 7. Yeast need food and probably they will not be able to get this from parsley. 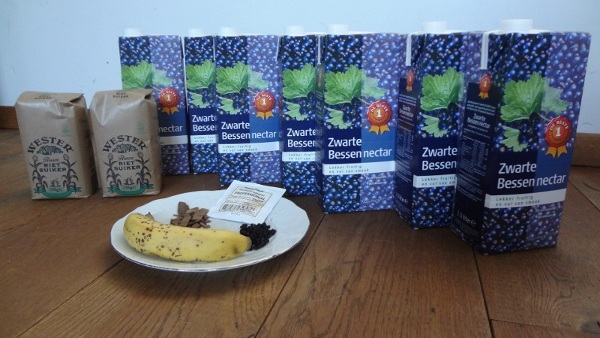 A wine made only from herbs or flowers will not have much body. Bananas are great for body. No idea why, but bananas in wine is never a bad idea. After 6 months I tried a bottle and I was not sure about it. It looked great but it was a bit harsh and the aroma was a bit green, flowery. It was not ready and could be better in the future. At least that was what I hoped. And luckily I was right. After 1 year it has become very nice. Of course it is not like a regular wine from the supermarket but it is not too weird. It is a very pale wine that has become very clear. It looks good. The combination of parsley and citric acid makes it very fresh. Maybe some people will find it too acidic. The parsley creates an aroma of flowers and has a great impact on the taste. Recipes that I found on the web mention a lot more parsley but I think that you can also make this wine with only 250 gm for 5 liters. In conclusion I would say that this was a very nice first attempt and I will definitely try it again. However I would change some details. I would use less parsley. I think that 250 gm would be enough for 5 liters wine. It tastes nice but it is not very subtle. I would also use a little less citric acid. Citric acid is the right choice but the combination with parsley gives the impression of a more acidic wine. Next time I will try 24 gm. With a great result I must add. Some time ago I tried to make a pilsner without the proper equipment. I do not have a location to ferment at the proper low temperature and therefore it does not make sense to use a lager yeast. It would produce too many esters which does not fit a pilsner. So I tried something else. 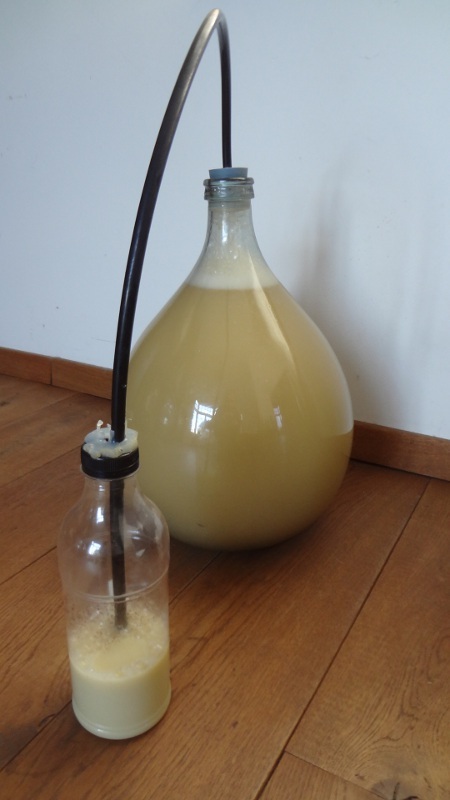 I tried champagne yeast because it ferments very well in wines. The result was a nice beer but obviously not a pilsner. So this time I decided to use a more normal yeast. In this case Fermentis US 05 because it does not produce a lot of esters and it ferments to a dry beer. The result is great. The champagne pilsner was a funny experiment but this is much better. It has a nice light hoppy aroma. The bitterness suits the type of beer very well. Not too bitter but definitely there. There are no aroma’s from the yeast or esters. It is very neutral. Since the alcohol level is not too high it is a very drinkable beer. The head is very good and the head retention is better than all my previous beers. I am sure that I will make this beer again. The recipe is exactly the same as the previous experiment. The only difference is the yeast. And it is obvious that the yeast is of great importance. 62 C for 45 min, 72 C for 15 min, 78 C for 5 min. Probably this beer is somewhere in between a blond and pilsner. The bitterness is there, the hop aroma is there but not very outspoken. It is a nice simple very drinkable beer. The head retention is very good. 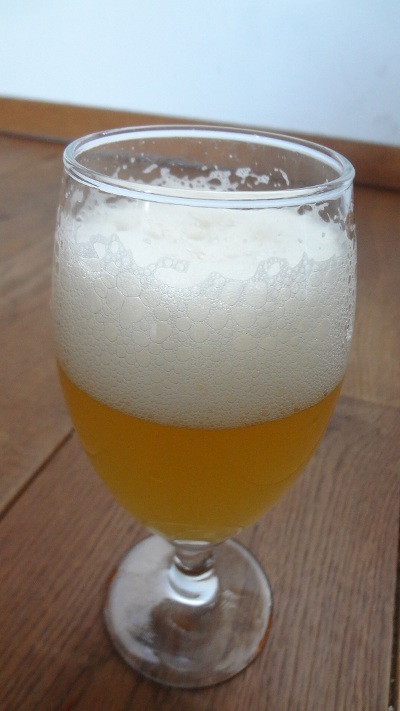 I think that it is the best beer I made so far. Who could have thought that making beer at home could be so simple? It is as easy as making lemonade. After my disappointing experiences with wine kits I was reluctant to try a beer kit but the beers are really surprisingly nice. Since I was making wine already I did not need to buy any equipment. The only thing I needed were empty beer bottles. The ones that I have are from Grolsch which have so called “flip top closures” so I don’t even need crown caps. There are instructions in the package but I don’t need them anymore. Actually my eyes are not able to read the small letters anymore. 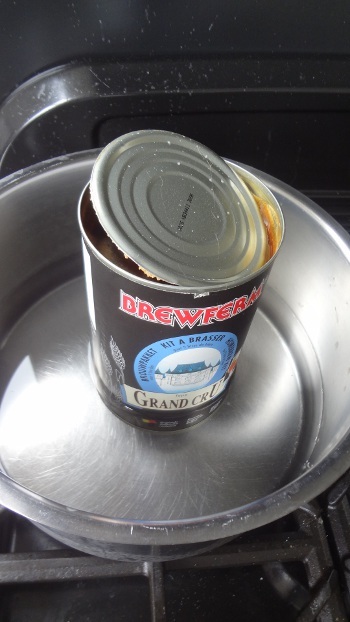 Open the can and place it in hot water. This way the syrup becomes more fluent. Start boiling water. This is not strictly necessary but apparently boiling the water results in better foam on your beer. Sterilize the fermenter and put in the syrup. Rinse the can with hot water to get all the syrup out. Watch out, the can gets hot. Add the sugar in the can and dissolve it in boiling water before adding it to the fermenter. Sterilize a spoon (And your hands). Close the fermenter and wait until the wort has cooled to room temperature. Add the yeast. After a few hours you will see that the yeast starts working. Keep the fermenter in a room where the temperature does not fluctuate too much. Yeast doesn’t like that. One day later you will see why you need a big fermenter. Lots of foam! This is the nice thing of a demijohn. You can see what happens! This was an abbey kit with wyeast abbey yeast. I discovered later that the yeast was too expensive to use for one kit but look at that foam! When the fermentation slows down I transfer the beer to a demijohn. 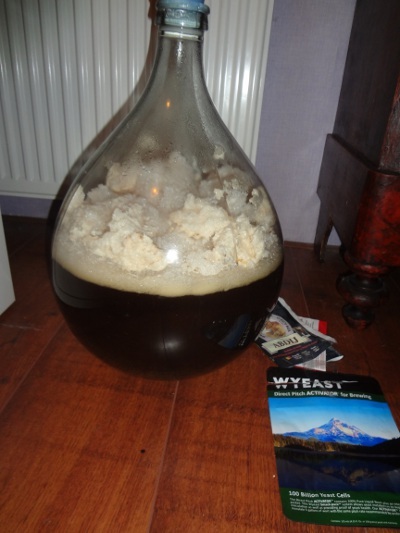 This is not really necessary but I need the fermenter more often and it looks nicer in a demijohn. After 2 weeks the fermentation is usually finished. You can check it with a hydrometer but I don’t do that anymore. When in doubt just wait a week longer. Then it is bottling time. Rinse the bottles with a sulphite and citric acid solution. Put the bottling sugar in another demijohn and rack the beer in it. Do not disturb the lees. 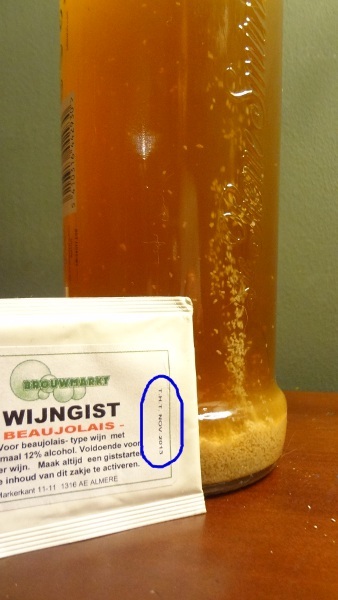 Make sure that the sugar is dissolved before bottling! Rack the beer in the bottles with the bottle filler. Store the beer in a room with constant room temperature and wait 6 to 8 weeks. Some beers will improve when you age them longer. At the moment I do not make the kits anymore. Nowadays I am brewing beer the hard way. But at the time I was already thinking about some experiments with the kits. For example; using another yeast, adding some hops, substituting part of the sugar for honey, using another kind of sugar, add some extra sugar for more alcohol, etc. etc.. 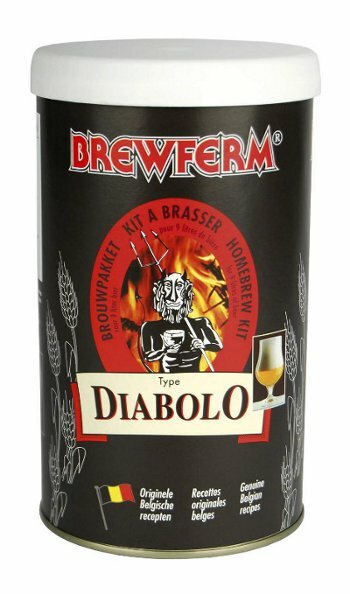 There are many things that you can do to create “your own beer” with a kit as a start point. When I started making wine my goal was to make a good red wine. I have no problem with white wine or rose but I prefer drinking red wine. I bought a few wine kits because I had no idea what I was doing. I did not like the results. It was wine, it was red, but in my opinion tasteless. Since I have no grapes or other fresh fruit I started experimenting with juices that I bought from the supermarket. I was very happy with the resulting white wines but making red wines continued to be problematic. During the fermentation the color becomes lighter. In many cases it becomes a dark rose but definitely not red. The acidity of the juices is too high. This does not suit red wine. The resulting wines have no body. So usually what you end up with is something that is more or less a rose with too much alcohol and a taste that resembles lemonade. Not bad as a rose most of the times but nothing like red wine. Then I started experimenting with additional ingredients. I used for example oak chips, bananas, vanilla, dried elderberries, and tannin. Again the results were not good because I used too much. Vanilla is a great addition but it is very overpowering and red vanilla wine is not nice. One juice became the exception: Black currant juice. I made red wine from it several times and it is pretty good. It can compete with the better supermarket wines. Boil the sugar, oak chips, tannin, elderberries and mashed banana for a minute in some black currant juice. Rehydrate the yeast in a little water. Put the black currant juice in a fermentation bucket and add the boiled mixture. This way it cools down fast. As you can see I did not measure anything. The amount of sugar in the juice is written on the package and I trust this. The acidity is probably a bit high so I will not add any. I am confident enough so I will not make a measurement. The amounts of additions are very small. This is mainly because they all give a lot of flavor and the oak chips and elderberries also have tannin. You want them in your wine but not too much. The banana is there to give the wine body. I have made this wine before but I always try to experiment a little with additions. This is also the reason that I use cane sugar. I have not tried this before and we will see if this is an improvement or not. 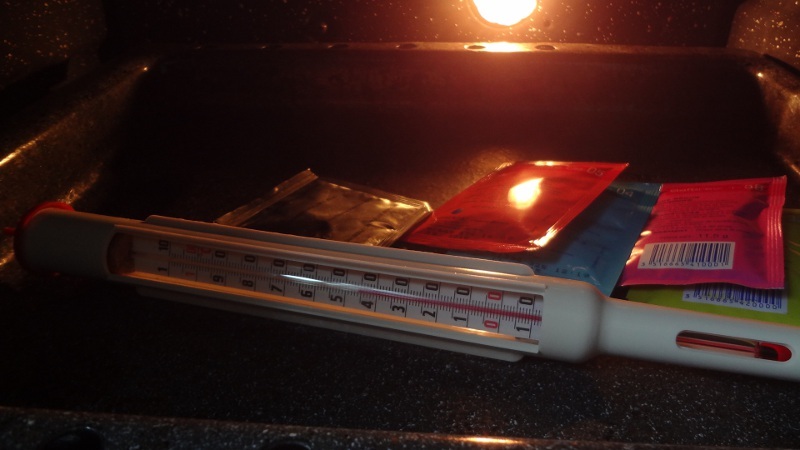 Heat the milk to 66 C. Stir the milk to prevent scorching. Leave it for 30 minutes at this temperature. Cool the milk as fast as you can. You can do this by putting it in ice water. If you add some salt to the water it will cool even faster. This method is called LTLH or Low Temperature Long Hold. Another method is called HTSH or High Temperature Short Hold. The procedure is the same but in this case you heat the milk to 70-72 C and keep it at that temperature for 15 seconds. According to the book from which I shamelessly copied this information, pasteurizing at the lower temperature is the best because some useful enzymes and bacteria can survive this procedure. Boiled milk falls under the definition Ultra Pasteurized milk. Which is (as far as my knowledge goes) not the same as UHT because this has to be heated to 137 C.
I have never tried this and according to some websites it is not possible to make cheese from Ultra Pasteurized milk. To make a not very long story even shorter; Don’t boil your milk. So here comes the DOOOHH!! part. I made 2 huge mistakes in these simple steps. This is an experiment. 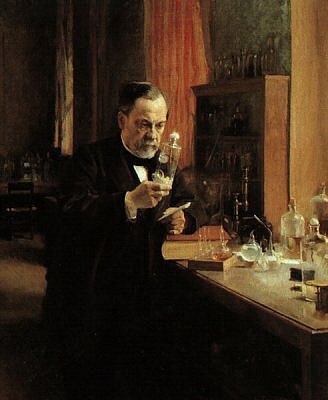 The goal of the experiment was to make a pilsner without the use of a refrigerator. Why? Well because I don’t have a suitable refrigerator and I am sure that lot’s of people like to make beer but don’t have the room for another piece of furniture. My first thought went to using wine yeast. Wine yeast usually don’t create a lot of esters and ferment until the last grain of sugar is eaten. Unfortunately wine yeasts don’t flocculate as well as beer yeasts. Champagne yeast is the best among the wine yeasts in that aspect. It also is a very strong yeast that can tolerate high levels of alcohol. 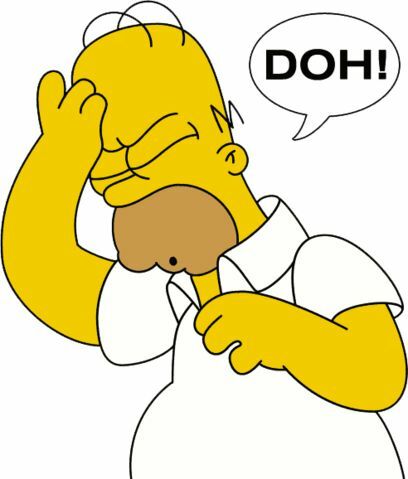 However after some research I found that wine yeasts cannot handle the more complicated sugars in beer. Of course the internet is not a great help because I also found some sites that claim that wine champagne yeast can ferment beer to dryness. Great, all this “information”. What can you do? I used mash temperatures which started a bit lower so I would get more “simple” sugars. Since I don’t have a refrigerator the fermentation was at room temperature. I stopped chilling wort some time ago and did not see a reason to do this. Since I like the Turkish hops I used them instead of the hops mentioned in the recipe. The fermentation started like crazy and after 2 days it looked as if it was finished already. I always leave the demijohn in peace for at least 2 weeks and then I measured the gravity. The hydrometer stopped at 1020. This was not great news. When you look at the table you can see that the residual sugar is 50 g/L. This is obviously very much and it means that only 3,5% alcohol had formed. After bottling this would total to approximately 3,9%. I decided to continue and see what would happen. After a few weeks I tried the beer and it was very nice. It was not pilsner but much more like wheat beer. An aroma of bananas and a good body. Since the higher sugars don’t taste sweet it actually feels reasonably dry and fresh. The colour is rather light and it is cloudy. Probably because the champagne yeast cannot compete with beer yeasts in terms of flocculation. In a strange way you don’t have the feeling that there is only little alcohol in it. Perhaps the higher sugars also give an alcohol sensation. I should look into that. With all the modifications it is not a surprise that the beer did not turn out to be pilsner but some lessons were learned. 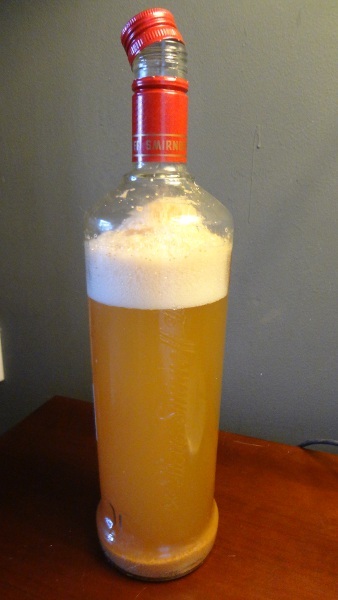 Champagne yeast can definitely be used in beer making. It does not create a lot of alcohol but still gives you a full bodied beer. I believe that it would be very suitable for a wheat beer. 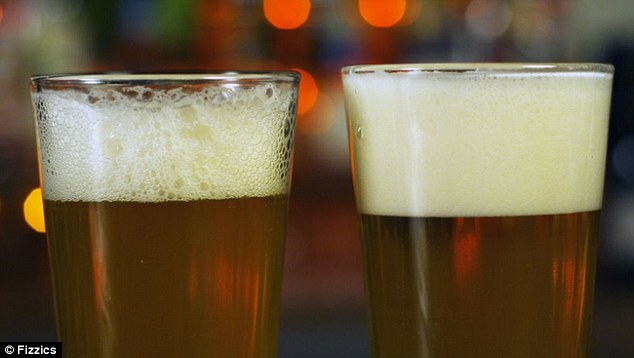 Champagne yeast does not ferment all the sugars in beer. If you want a low alcohol beer because your friends cannot handle it, please start your own experiment. Since this experiment is very drinkable I will start a new experiment very soon. That is what I love about making beer. It may not be what you aim for; It can still be very good! Fermentations can be deceiving. Look at the apple wine I tried to make yesterday. Fermentation would not start at all. I was lucky to get it going at all. And see what happens next! When the fermentation finally started I was still a little worried because it remained a little slow. For that reason I decided to put it in the 15 liter demijohn and fill it up. 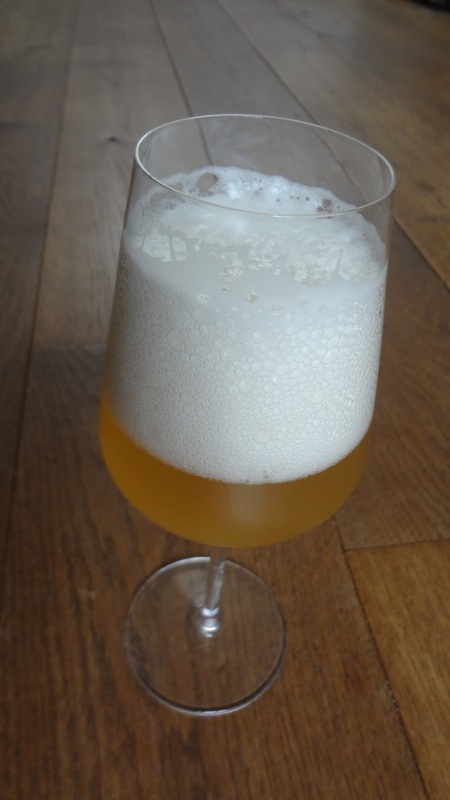 Champagne yeast usually does not create a lot of foam so I did not expect problems. Only a few hours later the weather changed dramatically. From a relaxed sunny day it turned into a hurricane. Fermentation became quite violent and I was afraid that the air lock would be filled with foam and eventually overflow and spill on the table. A simple solution is to accept the fact that it overflows and place the demijohn in the shower so you can clean it easily. Perhaps your family will not think that this is a brilliant solution. And they are right. A nicer solution is the Tsunami airlock. It obviously is not a high tech solution but it works good enough. And it is very easy to make. Make two holes in the cap of a bottle. The end of the tube should be close to the bottom of the bottle. 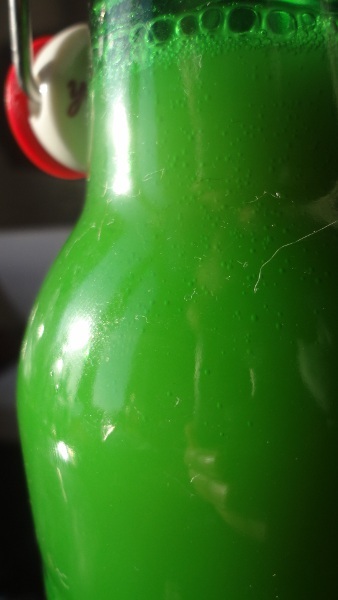 Connect the tube to the demijohn. Obviously it does not stop the foaming but the foam is collected in the bottle. Please note that in extreme cases the bottle will be filled, so you still need to check it.